Having recently returned from a conference in Pittsburgh, you've gotta know this system is good because it made me glad I went! Pittsburgh isn't exactly the destination you hope for during the arduous last few weeks of a terrible Chicago winter. However, I'm excited to say that we have learned about a wonderful new option in treatment for our patients suffering with a variety of foot problems. Custom orthotics are the gold standard in arch supports for the shoes. They are fitted exactly to your foot with care and thought taken to account for biomechanical abnormalities both during the casting for the insert as well as when considering external modifications to apply. They are, however, expensive. In a world where health insurance coverage is changing and some people still do not have health insurance, custom orthotics are not always a realistic option. The Quadrastep system involves a patented foot typing that describes (originally) 24 specific foot types. When the most traditional OTC inserts are primarily addressing 2 (high arch, low arch), this is already vastly improved. 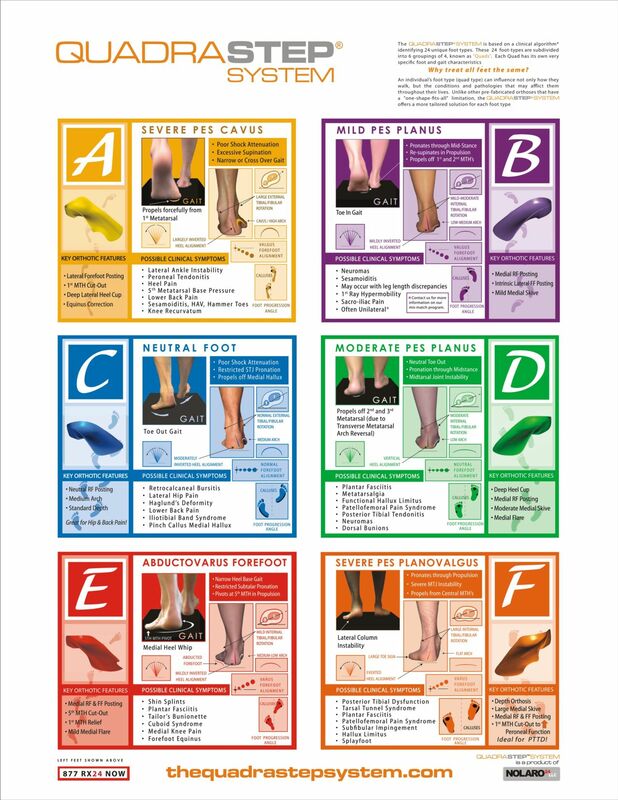 The system is more simplified into 6 basic foot types (6 basic inserts available) and leaves modifications still at the discretion of your podiatrist, at a fraction of the price of custom orthotics. What is equally exciting is how simple the process is to determine any given person's foot type. In a matter of minutes, the podiatrists at Prairie Path Foot & Ankle Clinic can determine which of the 6 major orthotic types will best correct your walking pattern. Whether you have foot pain for the first time, have worn orthotics for years, or want a secondary pair that your insurance won't cover - connect with us at Prairie Path Foot & Ankle Clinic to discuss a visit to determine your foot type today!